Field trip to Vida Verde farm in Pescadero, California. Back in February, I had a quick Bay Area layover where I stopped by the Stanford d.school to teach a pop-up course with fellow designer Gretchen Wustruck, founder of Curiosity Atlas, and Bay Area philanthropy movers and shakers Jennifer Kane, founder of Empower Philanthropy, and John Cassidy, founder of Klutz. Building on my social impact work at Google and these Creative Nomad Projects, along with the teaching teams’ expertise, we created a design thinking weekend slam asking students to solve non-profits’ challenges in innovative ways. First, to both work with students to strengthen them as design thinkers and community activists, as well as to build their skills and toolkits, enabling them to spread their knowledge beyond Stanford, within their home communities. And second, to engage and formalize ways for experienced, powerful designers to work within their communities on projects with purpose, with solutions to help their neighbors, and supporting change they can touch and feel. With newer designers, what can you really accomplish in a weekend? What is design thinking for local non-profits like, and what tools can we think about that are specific to their constraints? Puente a non-profit fostering economic prosperity and improving the living conditions, health and dignity of rural families living in the area. Vida Verde, who promotes educational equity by providing free overnight environmental learning experiences for students who don't otherwise get the opportunity. 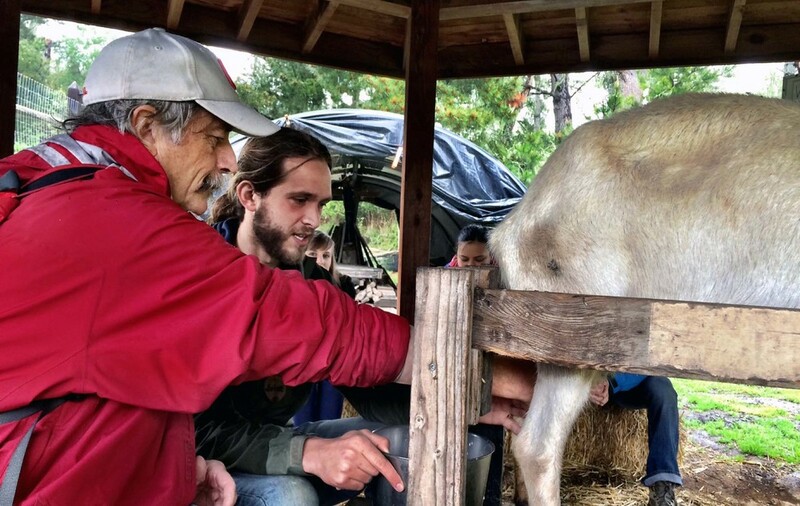 To gain empathy for the experience of the students who visit Vida Verde, we learned to milk a goat, and many even joined the 'fresh milk' club. As with any design sprint, the weekend flew by, and we received some great student feedback from the prototype. “It was amazing to see how the before somewhat unstructured ideas turned into a great end-to-end concept." As this was just a prototype, we already have the next iteration in the making, which will include long form coursework and design weekends to come. Personally, I think a lot about the differences between the Bay Area community - one rich with innovation, designers, and prototypes - and the one that I grew up in, in El Paso, TX, as well as the nomadic communities I’ve recently encountered - those without the same access to the abundance of amazing power designers and tech builders. How might we design a set of design tools, frameworks, and experiences for engagement at both ends of this spectrum? How might we design volunteering and social impact work that can most effectively harness designers’ skillsets? How might we enable and inspire non-profits to launch innovative projects and thinking within their own organizations? Be in touch if you want to join this effort.